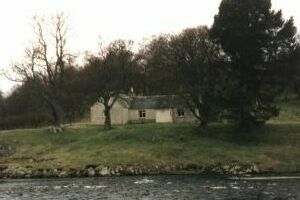 Inverbrough cottage, which was the farmhouse on the small hill farm of Upper Inverbrough (see this OS map) is located in the glorious highlands of Scotland, sitting on a bend of the Findhorn, giving it extensive views up and down the river. It has been almost entirely rebuilt and refurbished to bring it to the highest standard of modern living. About a mile from the centre of Tomatin village, 16 miles from Inverness, and an easy drive to many tourist attactions, it offers a premium balance between seclusion and convenience. Aviemore and Inverness train stations are both about half an hours drive away (on the A9), and Inverness airport can be reached easily in under forty minutes. Edinburgh and John O'Groats are both under 150 miles away. Tomatin is a small village with a shop, three churches and the worlds largest malt whisky distillery! It is well placed for touring in the Highlands; Loch Ness, Culloden Battlefield, the whisky trail, Fort George, Cawdor and many other Castles, are some of the varied and interesting attractions within easy reach. There is plenty of wildlife about and in their season you stand a fair chance of seeing an osprey from the cottage itself. Activities nearby include hill walking, climbing in the Cairngorms, pony trekking, swimming, observing wildlife, and golf at many fine courses such as Dornoch and Nairn or the small 9 hole course at Carrbridge. A new opportunity is afforded by the boats offering dolphin watching in the Moray Firth. For information on other local activities, visit the Highlands of Scotland Tourist Board. The cottage is situated right in the middle of the farm and the grazing is let. There are generally a lot of sheep and probably horses about. Indeed the sheep do come right up to the door. We welcome well behaved dogs that are safe with animals but regret that no other dogs are allowed. Naturally the responsibility for the dog is the owner's. Due to the outstanding location of the cottage close above the river we would not recommend it for toddlers who might fall in. Because of the fishing the cottage is let from Sunday to Sunday.